"I was simply enchanted by the beautiful chamber music. The soft melodies were perfect for a wedding and added an element of sophistication to the whole event. Hearing pianos and organs at a wedding will never have quite the same effect as what I heard today." "Sarah, I thought you all did a great job. It was just like I had imagined. Many people made comments about how nice your music made the event. Thanks again!" 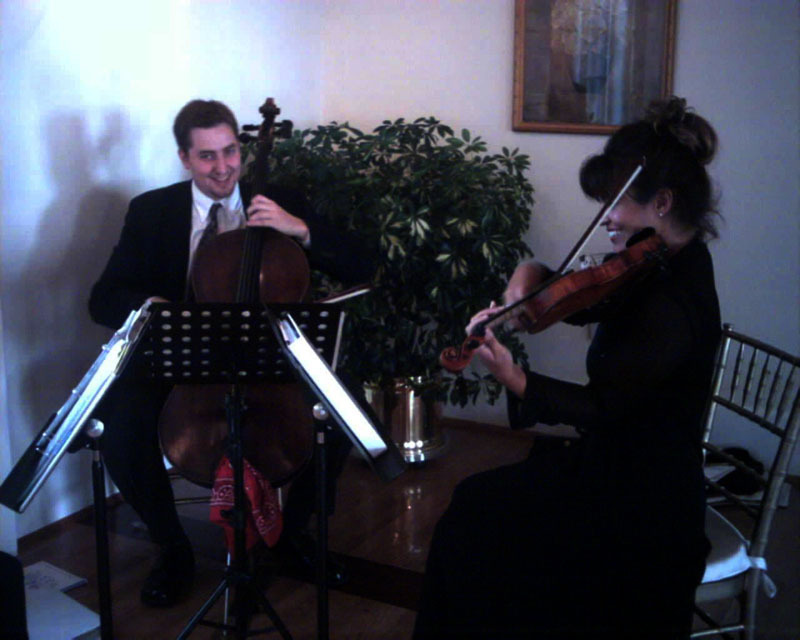 "Thank you for the excellent flute and string trio for my daughter's wedding reception hosted at a friend's home. Their classical style, combined with a stunning musical selection, made the guests feel welcomed and lent an air of beauty to the whole afternoon. GRACENOTES' professionalism and charm exceeded our expectations, and frankly, made us look good!" "The music was fantastic! Thank you for being so flexible. We have more daughters, so expect calls from us for future weddings." "My experience working with GRACENOTES was one of the easiest parts of the reception, without an exorbiant cost or any time-consuming effort. I was pleased and highly recommend GRACENOTES for any wedding, reception, anniversary, bar mitzvah or special occassion where your client is desirous of offering their guests and participants an afternoon or evening of enjoyment." "Everyone was enchanted by the beautiful violin music. It made them forget that our wedding was 15 minutes late getting started." "The music was just beautiful. The soft sounds of the violins created a mood and atmosphere that were absolutely breathtaking. Everyone commented on how wonderful the music was and how it added an elegant touch to the whole event. The music at the wedding was the only thing that was perfect." "GRACENOTES provided the music for the ceremony and it was absolutely perfect. I cannot tell you how many people have commented on how beautiful and appropriate the selections and arrangements were. Your 'Grace Medley' (Amazing Grace/Ashokan Farewell) brought a tear to my eye, as I stood there waiting to come out. Thanks for helping to make our wedding so wonderful." "...The ceremony music was absolutely perfect. It had the right feel and tone, a great tempo and all around was just exactly Alida and Patrick! We were amazed by the sound on the hillside and recognized instantly that the music 'makes' the event. Cocktail tunes were fun, happy and celebratory. We had so many compliments on the music and wish we could pass them on to you, word for word. Along with the sun coming out, GRACENOTES made the day for us, and we are so grateful. If anyone aks for references, please give our names so we can sing your praises." "...I just had to sit down and write to tell you how absolutely DELIGHTED Mike and I were with your performance at our wedding. We have gotten so many comments on how lovely the prelude, processional and recessional music was, and believe me; we had a discerning bunch of listeners in the crowd that day! I especially appreciated the fact that you two took the time to come out for the rehearsal and were so easy to work with. You were extremely professional, and it was so nice to be completely confident that no matter what other wedding calamities could occur, at least the music would be first class! So thanks again for all your help in making our wedding a truly wonderful experience. I am keeping your brochures handy, and will be the first to recommend you to anyone looking for exceptional classical musicians for any occasion whatsoever! "My husband and I wanted to thank you for putting a picture from our September 7, 2002 wedding on your website. We feel so honored! It was so great having you play on our special day. We received so many wonderful comments from our guests. When you played "Canon in D" as I walked down the aisle, I truly felt like I had always hoped I would on my wedding day. Thank you again."